Find the right fit with this trial-sized 2-pack of overnight protective underwear. 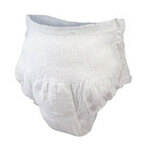 Protective underwear for men or women offers full coverage and maximum absorbency, with elasticized waist and legs. 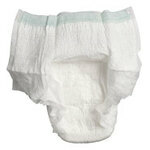 Specify by waist size: Small/Medium (28"-40"), Large (38"-50") or XL (48"-68"). USA. Find the right fit with this trial-sized 2-pack of unisex protective underwear. 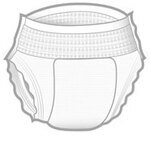 Absorbent protective underwear for men or women fit like regular underwear, with full coverage and elastic waist and legs to guard against leaks. Specify size: S/M (32" - 44"), L/XL (44" - 58").